I like making my own playalongs for practicing drums. I’ve always loved the groove in Marvin Gaye’s “What’s Goin On”, so I sampled this loop from a 2 1/2 minute vamp during a live performance of the song from I think 1971. The band seems to be made up of members of The Funk Brothers, the same Detroit session players who recorded the original track. 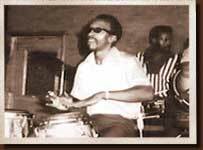 One of those guys is Eddie “Bongo” Brown’s, Motown’s conga player. The congas were on the left side of the stereo field, so I took the left side, bussed it to a mono track, and added some EQ and compression to bring out the subdivisions in the congas. I like playing drums over this loop because Eddie’s a badass, his playing is a big part of the Motown rhythmic feel, and there’s no drumset to play over. As you play along. you can try to replicate the original drum part, create your own grooves over it, or just use it as a sort of metronome. I like practicing rudiments and coordination exercises over loops like this that have some human subdivisions and a lot of feeling. In fact, ditch your click for a while! If you can play your Stick Control and Syncopation stuff inside Eddie’s pocket, you’re well on your way to becoming a more musical drummer. “As a member of the legendary Funk Brothers, Eddie “Bongo” Brown was the primary studio percussionist during the heyday of Motown Records, serving as a crucial element of some of the most enduring and transcendent soul music ever produced. Born in Clarksdale, MS, in 1932, Brown was raised in Memphis, learning to play virtually every hand-held percussion instrument but particularly excelling on the bongos and congas. After relocating to Detroit, he worked the local nightclub circuit before joining the fledgling Motown label in 1962, infusing the nascent Motown sound with elements of Latin rhythms. Funk Brothers bandleader Earl Van Dyke once estimated Brown played on “at least 97 percent of all the music that came out of Motown.